Sometimes you go out for dinner and the dish you order is so good you want to try it at home. Last August, while traveling to the Hudson Valley Rifest, we spent the night in Bloomsburg, PA and went to the Turkey Hill Brewing Company for dinner. 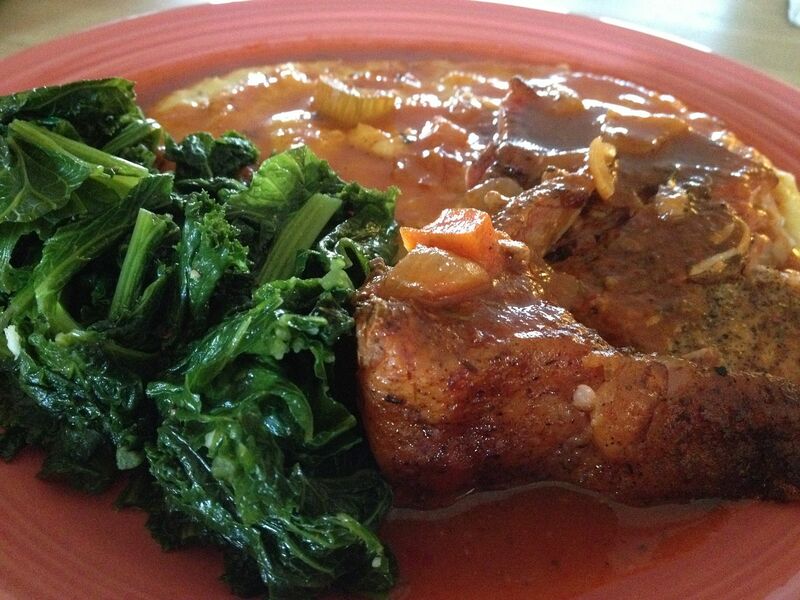 I ordered the special: Pork shank, braised in Bloody Mary mix. It was very good. So good that this instantly hit my re-creation list at home. It may have taken nine months, but I finally got around to giving this recipe a try at home. I must say, I think I did pretty good. I cannot find pork shank in my little neck of the woods. 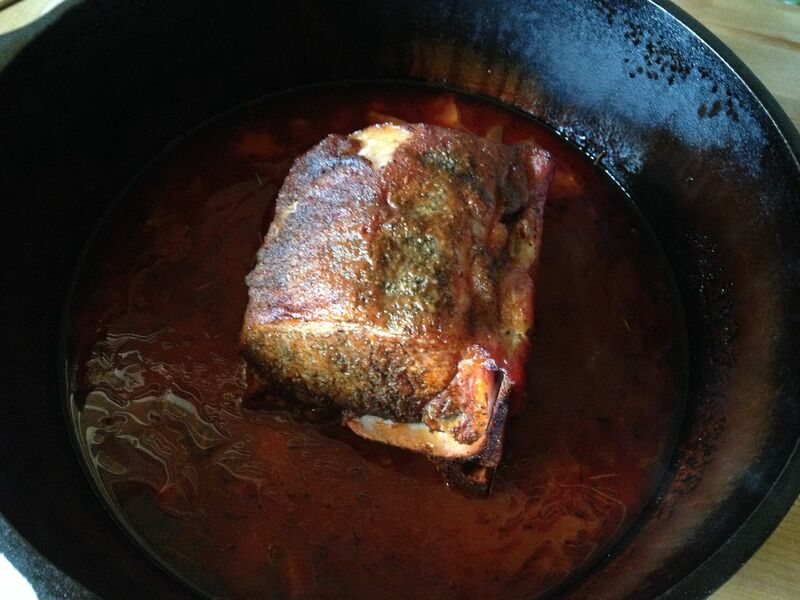 So, I substituted a bone in pork roast, about three and a half pounds in size. 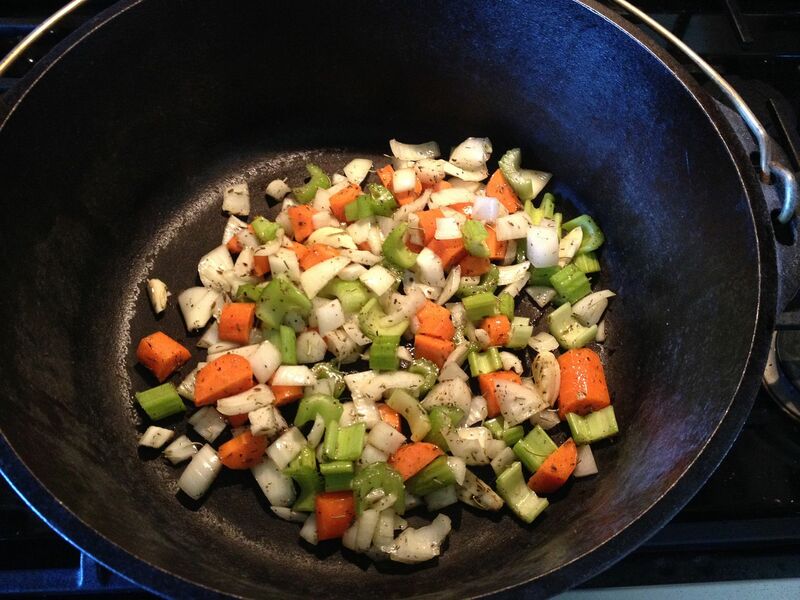 Next, I diced the following: half of a sweet onion, two ribs of celery, two peeled carrots, and four cloves of garlic. I tossed this mix in two tablespoons of olive oil, 1/2 tsp thyme, 1/2 tsp rosemary, 1/2 tsp sage, and some salt and pepper. 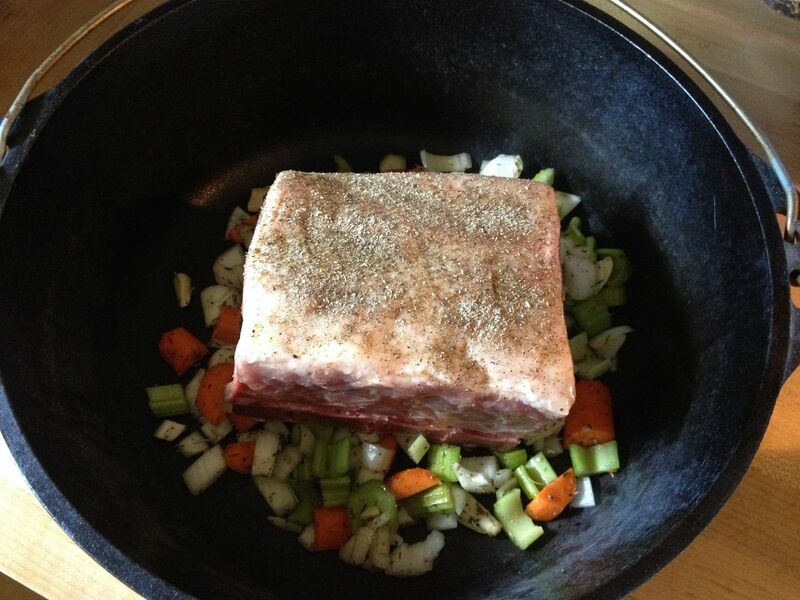 Once mixed, I spread into the bottom of my nine quart cast iron dutch oven. Next, I ground 1/4 tsp each rosemary, thyme, and sage in my "coffee" (spice) grinder. Then, I massaged some olive oil onto my pork roast and a applied this spice mix along with a light grinding of salt and pepper. Once complete, I placed the pork roast on top of this bed of veggies. While I was prepping, my smoker was lit and coming up to a temperature of 350 F. Once I was ready to start cooking my roast, I threw two chunks of apple into the ash pan for smoky flavor. 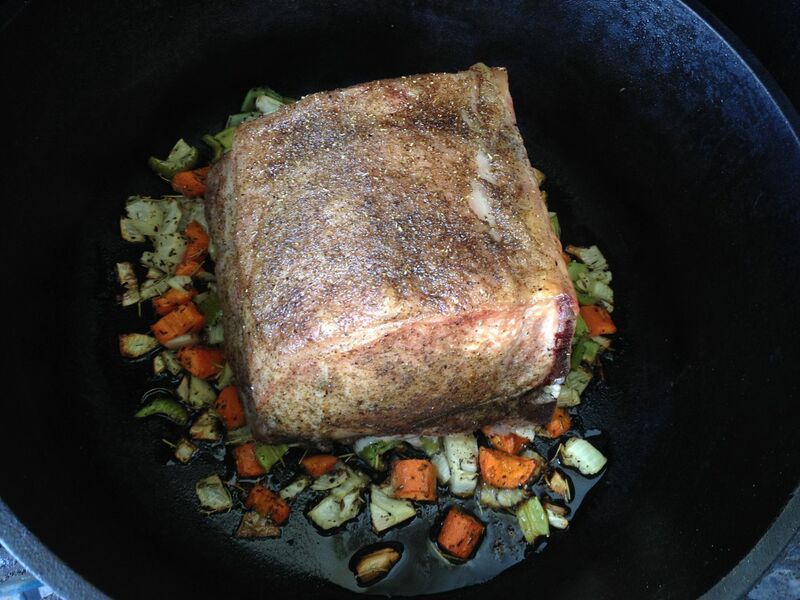 Once I had some thin blue smoke rolling, I placed the dutch oven in my smoker, lid off, too cooker 60 minutes. Here is how the roast looked after an hour. Perfect. A little bit of brown on the roast and the vegetables were starting to caramelize. Next, I added four cups of store bought Bloody Mary mix (that's one bottle) and two cups of dry white wine into my dutch oven for my braising liquid. Then, I put the lid on top, lowered my smoker temperature to 325 F, and walked away for three hours. When I returned three hours later to retrieve the dutch oven and bring inside, the smell emanating from the smoker was intoxicating to say the least. 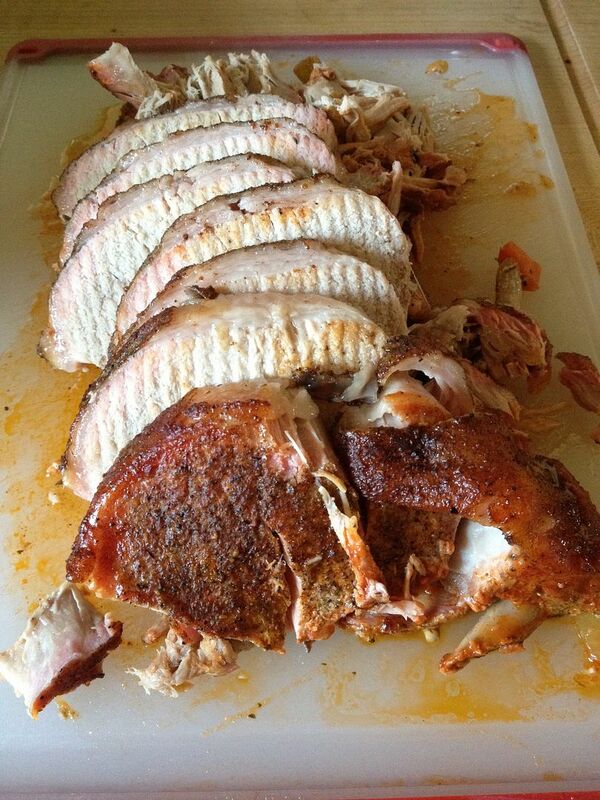 I could not wait to get inside and slice this pork roast for dinner. After resting with the lid on for 20 minutes, I removed the roast and started slicing. There was a little bit of everything on this piece of pork. The meat near the bone was pull apart tender and the bulk of the roast was sliceable. Tender, juicy, and cuttable with a fork. The wine, bloody mary mix, and spices came together to make a sauce packed with flavor. The veggies on the bottom were thoroughly soaked in the flavor. The one minor issue with the Turkey Hill offering was they they served their pork shank on a bed of roasted root vegetables. Good, but not great. 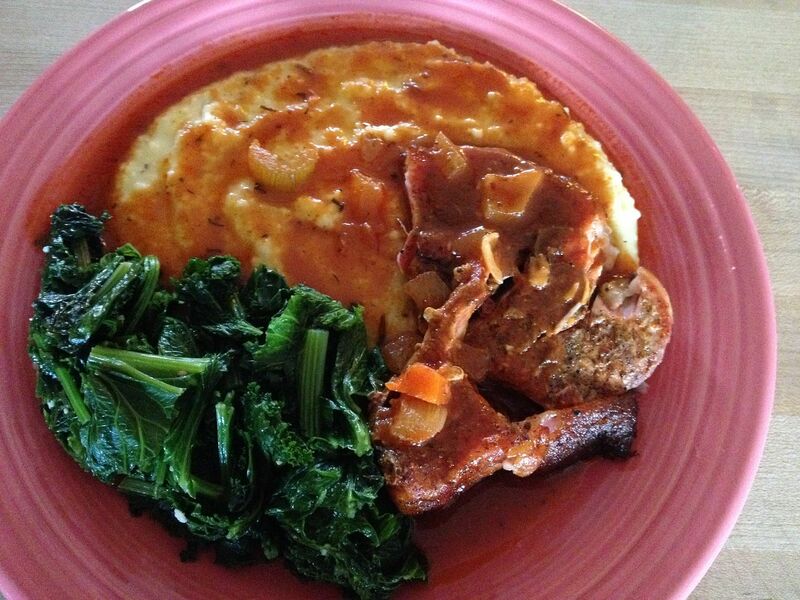 This sauce screams for something creamy, mashed potatoes or perhaps even grits. I opted for grits. So, I whipped up a batch of grits for my sauce. I even sautéed some mustard greens for the side as well. I was more than satisfied with how this re-creation turned out at home. I can't wait to make this dish again. Labels: Bloody Mary Mix, Grits, Pork Roast, Turkey Hill Brewing Co.
That sounds like a mighty fine feast. Cooking is so much fun when you can adapt a recipe to your ingredients and situation. 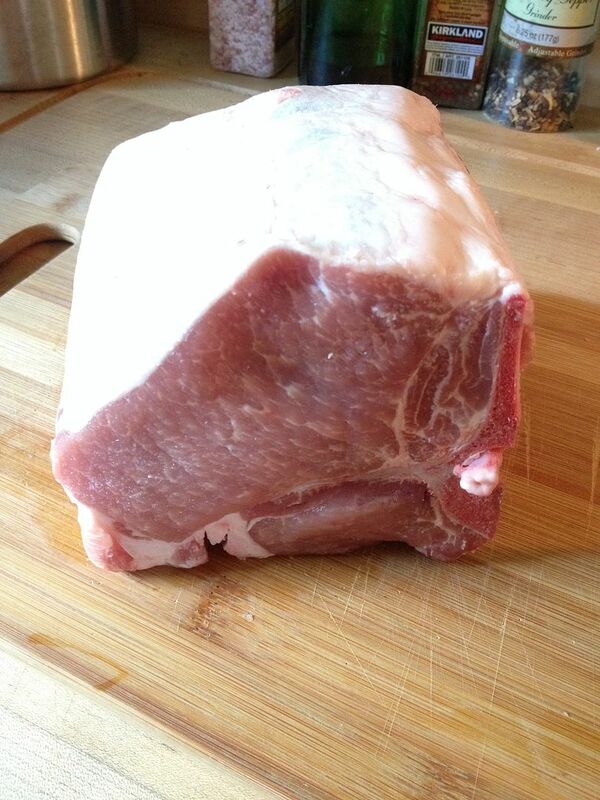 If you asked your butcher nicely, won't he order a pork shank for you? We have quit a few nose to tail butchers and they will gladly sell you any cut for a Premium price. Great dish.!!!!! This dish was very good Chilebrown. Fortunately, I made this on the last cool weekend we have had for awhile around here. Too hot for this now.